Japanese recipes & more since 2003. Home»The Just Bento Cookbook 2 is announced! The Just Bento Cookbook 2 is announced! Well, hi there! We haven't spoken in a while. ^_^; Well I have been around, still struggling with my health issues, but I do have some good news. 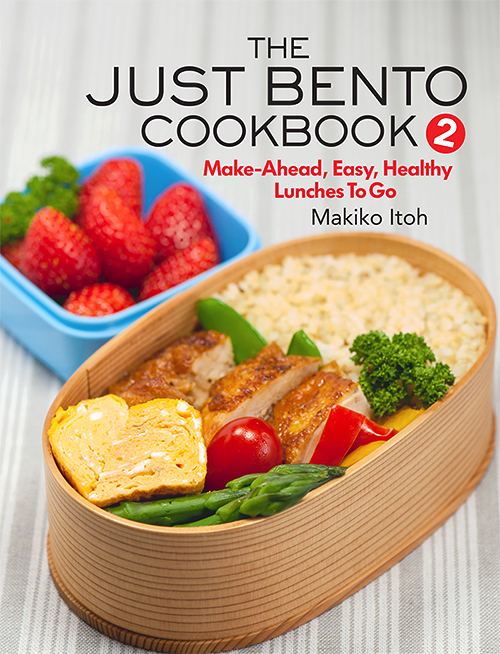 The sequel to The Just Bento Cookbook is now available for pre-order on the Amazons! The full title is The Just Bento Cookbook 2: Make-Ahead, Easy, Healthy Lunches To Go. I will have more details on the book in the upcoming weeks, but for now...here it is! The scheduled release date is January 2, 2018 (subject to change). I will put up more links as the book becomes more available. And, I am working to revive the JustBento site before the book is born too. Yes I am. Submitted by maki on 2017-08-09 11:16. Pre-ordered :) Can't wait for more bento goodness! Couldn't pre-order fast enough, your first book is fantastic and I reckon the 2nd one will be even better. I am so happy to learn that ! Maki, your recipes have been inspiring me for many years now. I’ve learned so much about Japanese cooking and culture through you! I actually just got back from my honeymoon with my husband—we took a month to travel around Japan. Thank you for being my cooking hero. I can’t wait for the second book. I can't believe it! I'm so happy to see that you're still around - and thriving. I used to read this site when I was twelve... Now I'm turning twenty. Just hit me right in the nostalgia, can't wait to buy it Maki!! So nice that you are releasing a new book, it looks really good :). All about my bento book! ©2003 - 2019 Makiko Itoh, JustHungry.com.